… said the rescuer in an email. Someone looked inside, maybe alerted by kids, and saw two thin, friendly dogs with red patchy skin, swollen faces, and runny eyes. Someone noticed how Mary’s teats dangled long and thin. Someone knew the breeding cycle would begin again soon, and decided to take them away from the horrors of backyard breeder life in coal country Kentucky. This is how Mary and George’s rescue begins. (This is Mary at left). Mary and George needed urgent medical care and weeks of recuperation, too much for this kind but poor Good Samaritan. So they were given to someone else who searched for a rescuer to take them. Mary and George were lucky; they were purebred Boxers. An independent rescuer, Moran, took them. (This was the third temporary home.) She wrote that they didn’t even know how to eat food from a bowl. They had only been fed on hard ground. Moran decided to try to get them into a Boxer rescue. Maybe they might be adopted up north. She contacted May of Minnesota Boxer Rescue and was told YES, we will take them! They would get medical care and when recovered enough to travel, they would be transported north to Minnesota for adoption. 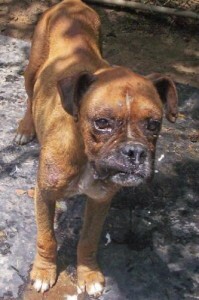 May begin to plan a 19-leg transport for George, Mary, and 4 other Boxers for mid-July 2010, from Kentucky all the way to Minnesota. And Mary and George began to recover, and they learned the basics of home living, including eating food in bowls. Eventually they were able to play with the 7 dogs in their rescuer’s pack. Finally, they were ready to go north. Mary is left, and George is right. In late June, May’s email appeal for transporters was broadcasted. I signed up for leg 17, Tomah to Eau Claire WI. And so it came to pass that Mary sat in my passenger seat on July 11. She was surprisingly small and so sweet. She looked longingly into my eyes and several times tried to crawl over the car console to curl in my lap. Eventually she began to snooze curled in her seat, and so did Trina and Jasmine in the back seat, while we sped north to meet the next driver. When we arrived at the meeting spot, Mary watched the other dogs on the transport walk about in the grass. I took this photo with my car phone. And shortly later I said goodbye. I thought about Mary and George a lot and decided that their story should be told. Their story is also the story of 24 people who worked to save them, 4 rescuers, 19 transporters, and a foster home in Minnesota where they wait today to be adopted. This is a story that is repeated hundreds and thousands of times every week across America. Circles of arms, strong steady arms, and their emails and their money and their cars, all linked together to save animals, one or two at a time. Mary and George are adoptable through Petfinder. Search at Minnesota Boxer Rescue. Will the family who adopts them please contact me? I’d like to continue their story. Anna – just a little side story. I was one of the transport drivers and drove George and Mary from Hinsdale to Gurnee, Il. The couple I met in Gurnee who took them to Milwaukee were 1st time transport drivers — a very nice couple. I was talking to the husband and he said he had to laugh — the names of his wife’s parents, who do transport driving, were George and Mary. Kind of cute! Myself, I kept calling the dogs George and Martha and I kept thinking of the characters George and Martha in Whose Afraid of Virginia Wolf? It’s particularly nice to know their story and eventually their happy ending. Mary and George’s foster Mom emailed me to say that they are both doing very well. Mary of course is getting heartworm meds but appears to be fine. George fits so well into the foster home that he might stay forever! Mary is a non-stop wiggler, she said. That’s what I remember about Mary. She is a love bug.